For all his talk of the importance of averting a debt default, Barack Obama.is increasingly signaling that major deficit reduction has become more than just a bargaining chip to bring Republicans aboard on a debt deal. He actually believes that cutting entitlements and reducing the deficit are laudable goals, which would mark “transformational” moments in his President. 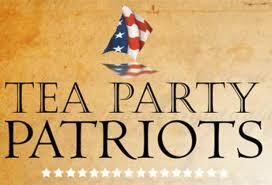 Let’s face it: the man is not a progressive in any sense of the word; he’s a Tea Party President through and through. To be sure, it’s tough to make the case that the Tea Party has anything like a genuinely coherent political platform. They hate entitlements, but one of their leading voices in the Senate, Rand Paul, conspicuously avoided any talk of cutting Medicare during his campaign (unsurprising, given how much of his income as an ophthalmologist involved treating Medicare patients). They also have a Presidential candidate, Michelle Bachmann, pledging never to raise the debt ceiling, yet proposing to slash the federal corporate income tax and eliminate the capital gains and estate taxes. But for the most part, a common thread amongst the Tea Party is a visceral dislike of “excessive” government spending. Virtually all buy into the notion that the federal debt levels are “unsustainable” and that entitlements, really need to be “reformed” (i.e. cut back). In that regard, their aspirations appear to be more in line with the President, than their ostensible GOP allies, one of whom is, Senator Mitch McConnell. The Senate Minority Leader has proposed giving President Obama the power to raise the debt limit on his own through the end of his first term, but to force Democrats to take a series of votes on the debt limit in the months leading up to the election. This would stave off the threat of defaulting on national obligations, but would make the President politically responsible for all subsequent spending cuts and/or tax increases. On the surface, this would seem to be a great deal for President Obama. He could in theory simply take up Senator McConnell’s offer, raise the debt ceiling and avoid the self-inflicted insanity of draining $4 trillion of aggregate demand from an economy still reeling from massive underemployment and wasted resources. Or the President could, as we and others have suggested in the past, simply invoke the 14th amendment and refuse to enforce a statute that he believes violates the Constitution. Professor Scott Fullwiler has suggested an even more creative way around the debt ceiling: Fullwiler notes that Fed is the monopoly supplier of reserve balances, but that the US Constitution bestows upon the US Treasury the authority to mint coins (particularly platinum coins). Future deficit spending by the federal government could thereby continue to be carried out by minting coins and depositing them in the Treasury’s account at the Fed (for more details see here). Curiously, the President won’t pursue any of these options. What’s the problem? If, for example, the President genuinely believes that the 14th Amendment does not give him the right to ignore the debt ceiling, he has been loath to give any reasoning for this publicly. Why not? He is, after all, a constitutional law professor. Yet, much like the single payer option during the health care debate, the President refuses to put the legal argument on the table, even as a negotiating posture. Is it caution, or does the President genuinely believe this guff about the deficit? By the same token, the President might well dismiss Scott Fullwiler’s idea as nothing more than a “gimmick”. But if the alternative is something which (in the words of Mr Geithner), could create “catastrophic damage across the American economy and across the global economy”, then why not deploy this “gimmick” to avert a default? “[T]he whole edifice surrounding government spending and bond-issuance is also ‘just an accounting gimmick’. The mainstream make much of what they call the government budget constraint as if it is an a priori financial constraint when in fact it is just an accounting statement of the monetary operations surrounding government spending and taxation and debt-issuance. The fact is that when a President really wants to spend money, he can almost always find a way to do so. During the Clinton Administration, Treasury Secretary Rubin and Deputy Treasury Secretary Summers did an end-around Congress (which was seeking to prevent the use of government money as support for a bailout of Mexico – or more accurately, a bailout for Wall Street banks which had foolishly lost money investing in Mexico) through the deployment of the little known “Exchange Stabilization Fund”. Until then, the ESF had been an obscure entity, the Treasury’s own honey pot, established by a long-forgotten provision in the Gold Reserve Act of January 31, 1934 for the purpose of stabilizing the exchange value of the dollar. The ESF was certainly not created simply to help the President go around the backs of Congress. Yet the President did it and in effect called the GOP’s bluff (and, for the record, the Republicans never went to the courts to challenge the decision; they waited for the far more important event of the President having sexual relations in the White House with Monica Lewinsky before going the legal route). To be sure, one can argue that Mr. Clinton was serving his patrons on Wall Street, when he performed this action. But whatever the motivations underlying the use of the ESF, it made clear that Bill Clinton wanted to spend government money and got his Administration to find ways around the opposition of Congress. Call it a gimmick, but however questionable the motives underlying the action, it showed a President prepared to fight for what he thought was an important objective. Clinton certainly didn’t try to jump ahead of Congress on this issue. He fought them. Arguably, it set the stage for the more aggressive fight to keep the US from defaulting in 1995, during which the Gingrich-led Congress sought to shut down the government by initially refusing to sanction an increase in the debt ceiling. “Big things” – like destroying the New Deal and what’s left of The Great Society. Who knew this is what Obama meant when he said he wanted to be a “transformational President” like Ronald Reagan? He’s gone a lot further than Reagan dared to contemplate on the issue of entitlement cuts. President Obama actually believes this poisonous nonsense about the US on the verge of becoming “the next Greece”. This was confirmed yesterday by Press Secretary Jay Carney, who said of McConnell’s proposal that it was not the President’s “preferred option.” McConnell’s proposal for avoiding debt default — to transfer full power to raise the debt ceiling to the White House for the remainder of Obama’s current term, cutting Congress out of the process — does nothing to address deficit reduction, Carney said. And Obama is set on making sizable cuts. Yet again, the President shows profound confusion on the issue of the deficit. He fails to understand that if private spending is lagging then public spending has to fill the gap. Otherwise output and employment growth will be sluggish if not negative. To cut into the huge pool of unemployed and underemployed labor, employment growth has to be faster than labor force growth, which means that real GDP growth has to be faster than the sum of labor force and labor productivity growth. These facts are very simple and indisputable. 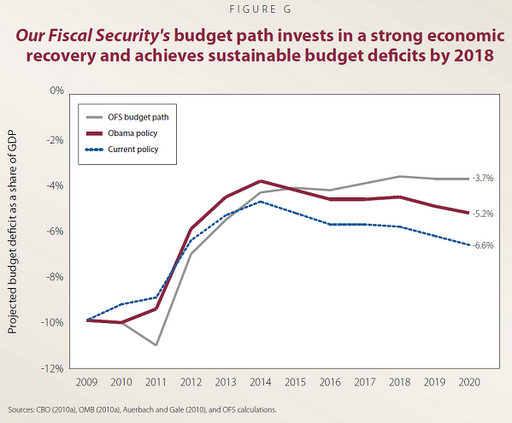 Cutting public spending at this juncture is the last thing the US government should be doing. Yet this President is pushing for the largest possible cuts that he can on the Federal government debt. He is out-Hoovering the GOP on this issue. He is providing “leadership” of the sort which is infuriating his base, but should endear him to the Tea Party. This is “the big thing” for Barack Obama, as opposed to maximizing the potential of his fellow Americans by seeking to eliminate the scourge of unemployment. Instead, his big idea is to become the president who did what George Bush could not, or did not, dare to do: cut Medicare, Medicaid and Social Security. What more could the Tea Party possibly want? Today’s post by Randy Wray was the second in a two-part series criticizing Washington progressives for failing to take an aggressive position against the deficit hysteria that is gridlocking our nation. 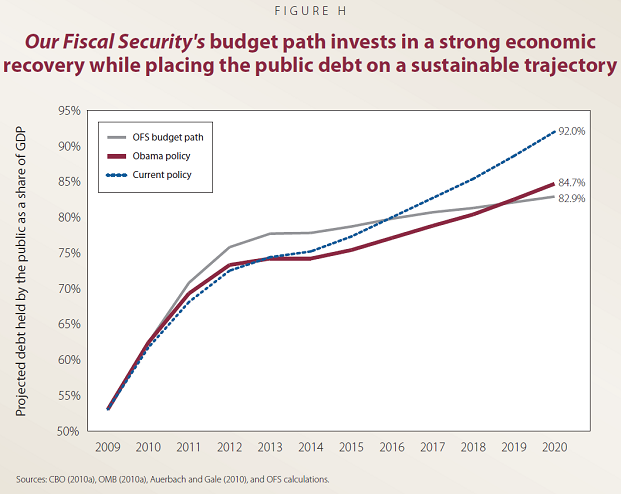 While Washington fusses and fights over debt limits, supposedly unsustainable debts and deficit, and fears of fiscal crisis, the prospects of a double-dip are ever more dangerous. More than 14 million Americans have lost their jobs. It is time for progressives to recognize that our sovereign government has the fiscal capacity to deal with the crisis and that deficit hyperventilators like Pete Peterson can be defeated with MMT. We are offering to publish here at NEP responses by beltway progressives to the “Pinch-Hitting for Peterson” series. We look forward to their responses and to what we hope will be a lively debate.